With the new Codex, Grey Knights have come into their own. They have quite the heraldry as well. Limited in color and symbols, their iconography is just a unique as they are. I've had the chance to do some Grey Knights projects over time and thought I might put some of that together in a post along with some banners for folks looking to add some iconography or banners to their Grey Knight force for that extra touch. The top picture is from a project I did for a friend of mine a long time ago. 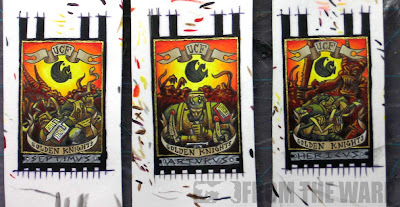 He had three dreadnoughts (this is long before a Dreadknight had even been thought of) that he wanted banners done for. As a way to tie them all together, I decided to make them into a mural and have all three be parts of a larger image. The larger image could be seen when the dreadnoughts were lined up on the tabletop. While the imagery on those banners doesn't fit the traditional Grey Knight theme, it was pretty cool to see the vibrant colors on top of the traditional silver models. But you don't have to have crazy colors to get a nice looking image. I've always loved the scene from the Sistine Chapel known as the "Libyan Sibyl." For the longest time, I thought this could be turned into an amazing Grey Knight banner. Once I had my own squad complete, I decided it was time to try my hand at making the image fit in the 40k universe. I ended up making it a bit bigger than normal just so I could squeeze as much detail in there as possible. I decided to tie them to their purpose of Daemon hunting by making one look like it was coming out of the opened book in front of the female figure holding it. Not so much that she was summoning it, but had control over it and could put it back in it's own world when she chose to do so. Was it a complete success? 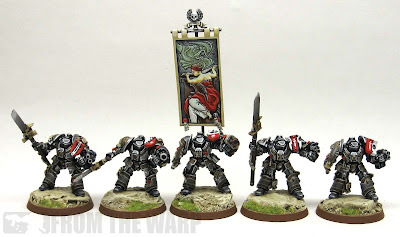 Maybe not, but I think the idea behind the image is killer and would certainly try it again now that I'm a bit better at doing banners if I ever built a Grey Knight squad. I did manage to squeeze the red color into her robes along with the white that Grey Knights usually have in their classic color scheme. 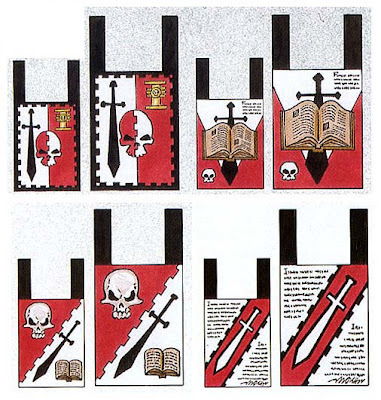 When it comes to traditional imagery, you can't go wrong with red, white, black and some kind of Inquisitorial =I= or skull symbol. 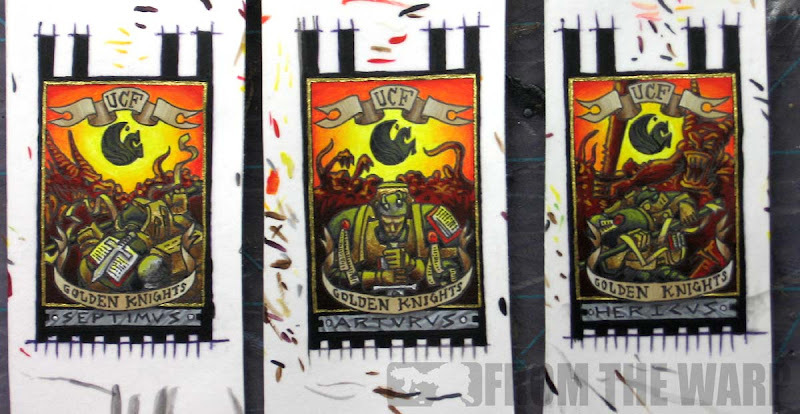 In a previous issue of White Dwarf, GW put these banners out as inspiration for folks to draw from with their own armies. The remaining images in the post come from Games Workshop. All I've done is share them here for you all to see what they've done and use them for your own army. 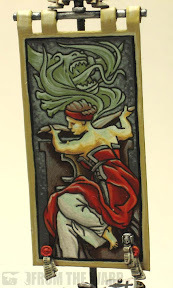 You can certainly print these out or copy them and redraw/paint them for your own army. Sometimes just adding a banner to a squad or dreadnought can give it new look and move it up a notch. Like a good basing scheme does for an army. It adds that extra bit to make them look all the better. 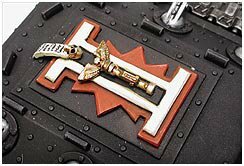 Another option is to take the Inquisitorial theme and turn it into something you can add to your vehicles. By making a series of overlapping shapes, you can build up your elements that can be glued to vehicle tops and doors to add some character. It's as simple as drawing out your design on cardstock or thin plasticard and layering it onto your vehicle. So whether or not you add banners or the occasional low relief icon to a vehicle, these kinds of things really add your army. It can be an easy way to add some great detail to your force and make it stand out from all the other Grey Knight armies out there. I still have those GKT's, they live in Indianapolis, and get ooh's and ah's when I pull them out to play with them. I've thought about having you paint a Thawn model to go with them. Farmpunk: I always liked that squad. Nothing fancy at all about them, but they just looked so cool on the table. Nice article Ron. I've gotta paint up a banner for my marines soon and this has given me a few ideas. Snake88: I'm going to be adding more banners soon too. It's just going to take me a few days to get them all posted up.